No early games today, so another sleeping in day! No alarm, in my book, means a piece of heaven on earth. Here’s a sometimes cool, but today crappy, part of being on social media. They show you memories from this day a year or two or three or whatever ago. They just pop up first thing. Well, this morning, the picture was from three years ago. Chandler and I were at a friend’s wedding. We danced and danced and danced. 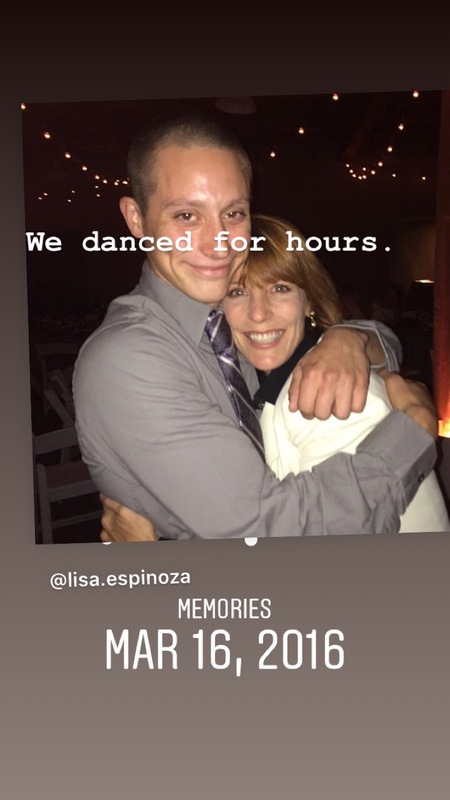 I was so proud to be dancing with my son. He had quite the moves….not unlike his Grandpa Bill back in the day. Such an unexpected image that brought back a flood of wonderful memories mingled with searing pain. These are the moments when I have a choice to make. I can feel what I feel and then keep moving. Or I can let it stop me in my tracks. That’s a perfectly acceptable option, by the way. But today, I chose to feel what I felt and then keep moving. WWHC? Put one foot in front of the other. Do what you love. Do what brings you life. So I went down to the gym at the hotel and did a HIIT workout. When I got back to the room, Charli told us Chance’s new song, See Me, was on iTunes. I’m grateful that he can use his gift for songwriting as an avenue by which to help him process this whole ordeal. We listened to the song. Just wow. I know Chandler is proud of his brother. For lunch we went to Benihana. That onion volcano with the smoke billowing out of it just never gets old. I veered from my usual hibachi steak and got a spicy crunchy tuna roll. Have I said it before — I LOVE trying new things?! Once again, watching Charli play soccer was a treat. After the game, she had a few tough moments. “I always used to talk to Chandler about how I did in my game.” She probably could have asked for anything at that moment, and we would have given it to her. She just asked for a smoothie. So before leaving Vegas, we stopped at a smoothie/tea place called Bover. Charli got her pitaya watermelon smoothie and I got an almond milk tea — fulfilling our mission to try as many different boba/milk tea places as we can. On our drive home, Charli did homework and we sang along to a couple of decades of music on Sirius radio. How do I remember the words to every song on the radio from 1970 on but can’t remember where I put my keys? Nearing home, as we passed through Lake Forest, my eyes fixed on the lights over Etnies Skate Park. Lots of hours spent watching Chandler do what he loved to do at that skate park. One Sunday, he was in a BMX bike competition at Etnies. I remember Chip and I looked at each other as Chandler prepared to do his run, acknowledging our mutual concern that he was about to do something not quite safe. Sure enough, with a look of shear determination, he took off pedaling like crazy—on a mission. We simultaneously gasped as he catapulted his bike up a ramp and executed a backflip. All morning, I thought about and prayed for my dear friend, and her family, on the one-year anniversary of losing her daughter. I can’t imagine what it’s like, what it will be like, approaching such an unwelcome anniversary. All in all, it was a good day with a tough start. Funny how one of the highlights of my life — dancing the night away with Chandler — can turn out to be a punch in the gut first thing in the morning.